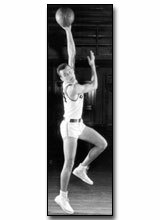 Larry Friend was a basketball All-America in 1954 at Los Angeles City College and All-America at the University of California-Berkeley in 1957. He led the Golden Bears to the NCAA finals in his senior year, losing to Bill Russell's Univerity of San Francisco team. At Berkeley, Larry set a single season scoring record--1,061 points/14.9 average--a mark that stood for ten years. Larry became one of the owners of the Phoenix Suns NBA franchise in 1968, and was actively involved with the team through 1983. In 1982, Larry was named to the "Silver Anniversary Team" by the NCAA. Chicago born, Larry came to Los Angeles as a teenager, and starred for Fairfax High School.